After battling opponents of his project for more than 20 years, Daldio listed the property for sale at $19,750,000. 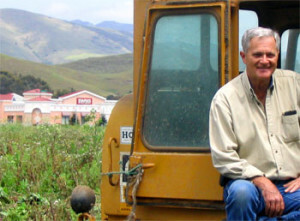 In 2006, San Luis Obispo County voters approved Measure J entitling the property to uses including 530,000 square feet of commercial/retail, 198,000 square feet of business/office, 60 residential units, an organic farm and farmer’s market and sports fields. The property lies within San Luis Obispo city boundaries, but it is unincorporated. The prospective owners are expected to try to have it annexed into the city. Pearce and Grossman said they plan to focus more on residential then the commercial uses approved by voters. However, the plans approved by Measure J do not allow the developers the ability to make major changes. Pearce told the Tribune that they may not be required to help fund a previously required interchange at Prado Road if they increase the number of housing units and lower commercial space. The escrow is slated to close in October. If it were up to me I would build the biggest IN AND OUT burger restaurant in the world…hmmm I’m getting hungry. I think I’ll head down to In and Out right now. No there is Lowe’s and Macy’s. This really is ironic. Criminals (including SLO’s mayor) thwarted Dalidio’s attempt to develop his own land through the infamous and illegal “Save our Downtown” lobby. These shenanigans allowed Madonna, Pearce and company to poach businesses that would have went into Dalidio’s development and instead crudely line then up along LOVR without government interference. Now they (at least in part) buy-out Dalidio! If the quality of the hideous development along LOVR is any indicator, the final development of the former Dalidio property will be FUGLY. This proves once and for all that the “Save our Downtown” lobby had nothing to do with saving anything. It had to do with criminals turning a buck with the assistance of local government. What’s terribly ironic, is that the Crony Capitalists duped the Environmental Nazi’s into believing Ernie represented evil. SLO county politics is an insult to democracy, for which this country once stood. As a tribute to Ernie, and how he was screwed over for 20 years, I would like to see Madonna & Grossman turn the property into a feed lot. Methinks that a hog confinement facility would be most appropriate in this instance…. Let’s make sure that Madonna puts in that new Los Osos overpass because they have certainly benefited the most from their connections with SLO Council and Copelands in developing Los Osos Valley Road with few hurdles (Home Depot, Costco, Old Navy, Pet Smart, Target, Duck, Olive Garden etc. ec. etc.). This overpass needs to be completed before another construction project is started. But fear not, under Marx’s leadership because we all know how she runs those dirty campaigns, Madonna will not be required to build an overpass, this will be done at the expense of SLO taxpayers. Government spending, especially in SLO, just keeps growing and growing, and all those new stores on Los Osos Vly Rd bringing in all the new sales tax just verifies the spend, spend, spend theory! SLO can grow because they have all of that North County water yet to perfect within their Salinas Resevior. SLO vs The Paso Ground Water Basin, forget wasting your time with that grapists dilemma. Read a few days ago about their plans for the land. Little different than Ernie’s. All looks good to me. Now for all the NIMBY’s to come forward and tell us what is wrong with this proposal.